Well, well, well, it is 11 September and it is the countdown to the launch of All You Knead Is Bread, published by Ryland, Peters & Small on 11 October and available to pre-order on Amazon! As the countdown continues, here is another free recipe from the book - and this month is is for Rye Bread. Rye has a bad reputation. People think is is heavy and dense, "brick like" and black. Well, it need not be any of those things. It can be very light and almost airy in texture and it certainly does not need to be black. "Black bread" like pumpernickel or Danish Rye is black because of the added molasses (treacle), not because rye flour is black. In fact, rye flour is rather "greige" (that is to say, greyish-beige) and comes in two varieties - "dark rye" which is the whole grain flour - it has the bran and the germ in it and "light rye" which is sieved to make a lighter flour. Light rye makes a slightly higher and lighter loaf than dark rye - just like white wheat flour makes a lighter and higher loaf than whole wheat flour. Rye does have gluten but it is a different kind of gluten than that found in the family of wheat flours (spelt, emmer, einkorn, kamut). Rye bread will never have domed top like a wheat loaf and it will never have an open texture, with lots of big holes. It just does not do that. On the other hand, because the gluten is not stretchy, you don't need to stretch it to get it to perform at it's best and this means no kneading! Stir, tin or basket, rise and bake! it could not be easier! As a final plug, rye is a slow release carbohydrate (low GI) so is very good for diabetics or people who are slimming. Without further ado, here is an easy recipe for delicious rye bread. Note: rye has a strong flavour and thus absorbs flavours really well. Spices such as cumin, coriander, and carraway are traditional additions - a teaspoon of ground or whole spice is enough. Honey, molasses, or malt syrup are wonderful additions - a tablespoon is a nice amount. Dried fruit and nuts are also lovely. A handful should do it. In this particular loaf I substituted red wine (we had a half full bottle) and added some toasted walnuts. That is why the photos of the dough show it pinkish and lumpy! Regardless of the type of yeast you are using, measure the flour into a bowl and make a well in it. Sprinkle the yeast into the well and add 100 g of the water (wine, whatever). Let it sit for 15 minutes or so until the yeast if fully dissolved. 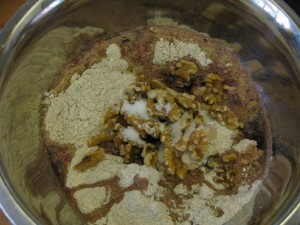 A beige sludge may or may not form on the top. Don't worry about that, as long as the yeast is within the sell by date. After 15 minutes, add the rest of the water and all the other ingredients. Stir everything together to thoroughly mix the ingredients. Your dough should be very soft - if it is the slightest bit stiff add some more liquid. Rye absorbs a lot more water than wheat so don't be surprised if you have 260 or 270 g of water (or other liquid) to your 300 g flour. Scrape the dough into a ball in the bowl. Grease a 1 Lb (500 g) bread tin with a hard fat like butter or lard. Thoroughly wet your hands and pick up the dough. Pass if from hand to hand using one hand to hold the dough and the other hand to smooth the top, rolling it over a few times until you get a little oblong that is the length of your tin. Pick up the tin and gently place the dough in the tin and then - here is the important bit - put the tin down and WALK AWAY! Don't push the dough into the corners or even smooth the top. Rye simply fills the tin and rises to the top. The key is a soft dough - so soft the handprint is left after it is tinned! 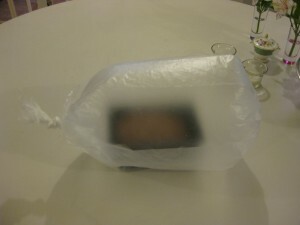 Cover the dough with a shower hat or put it into a plastic bag. The rye will rise and it is sticky so you don't want to cover it with plastic or with a tea towel because the dough will stick to it. If you don't have a bag or a shower hat, generously flour the top of the dough or cover it with oats or seeds so that you create a barrier between the sticky dough and the plastic or tea towel. Let the dough rise for 2-3 hours at room temperature or in the fridge over night or all day. You will know it is ready for the oven when it has come to the top of the tin and there are little holes on the top of the loaf. The dough in the tin in a blown up plastic bag! Preheat the oven to 200 degrees and pop the loaf in. If you want to you can decorate the loaf with seeds or spices (spray the top of the loaf with water before and after the topping goes on so that it sticks) or you can simply sprinkle some flour on the loaf (in this case, don't spray). Bake for 45 minutes and then cool completely. Rye is best eaten 1-2 days after it has been baked. Perfect little loaf with a floury top - the pink has baked out! For ease and flavour this is my very favourite bread of all. To read more about baking rye with different kinds of yeast in a non exhaustive and non exact time trial, have a look here. Lots of people were writing in with the trouble they were having with instant yeast. Short answer: for some reason, it does not work well and certainly not if you do not proof it. Have a read! This recipe looks awesome and easy for first time bread baker. My question though is you call for the oven to be set at 200 degrees I'm wondering if you mean 200 Celsius? Thank you so much and hope my bread is a success. Hi there, yes I do mean 200 celcius! Thank you so much. I live in British Columbia, Canada and I'm still baking in Fahrenheit! I am so looking forward to trying your recipe and I love that it doesn't call for sugar as I'm diabetic. I've made this bread for the first time and it is delicious. By far the best rye bread I've had. Thank you! I am so pleased! Thank you! Hi, sounds really great, i'm going to make it this weekend, please could you tell me how the yeast work because no sugar is added to feed the yeast so it can rise. you don't need sugar to make the yeast work! sugar makes it work faster but there is enough sugar in the flour to keep the yeast happy! it's a kind of instruction from the 1950s for the busy housewife (like leaving the bread in the airing cupboard which it does not need either!) Good luck and let us know how it goes. We love photos too! My first attempt was not very good. The bread tasted fantastic, but it did not rise very well, my fault, the dough was too stiff, I will definitely be making it again, next time I think I will make the dough wetter. What should the consistency be of the dough. Oh, I wish you had a link to this page from the page with the recipe on it ! Or better still, maybe you could edit that page to mention the problem with instant yeast... I have a loaf failing to rise right now! Ah well. I'll leave it overnight... if it comes to life I will leave another comment. Thanks for a super website - lots more recipes to try. the recipe sounds realy easy, however I have a bread machin which suppose to make this process even easier. can I do this bread in the bread machine? I am just about to try this recipe. It looks excellent. Can you confirm that 250g of water (or other liquid) means 250 fluid ounces? I don't think I have ever had to weigh water before! Hello Steve - 250 grams is the same as 250 mls and is NOT the same as 250 oz. Hope this helps! Weighing water is more accurate than measuring it in a jug but as bread is not a science and you will have to adjust manually in any case (remember - WERY WET dough) using a jug is perfectly fine! Happy to have found this breadmaking blog & great site!! I only use rye flour and shape them into about 36 rolls. After I let them rise for an hour they are all sticking together, which is good. The last few times I didn't let the dough rise a second time which resulted in extremely hard crusted rolls that were too difficult to even bite into ! 3. Since they are rolls, is the cooking time less and at what temperature in celsius? It seems that preheating the oven creates a hard crust. We prefer a softer crust but want the rolls to be cooked inside. Hope you reply whenever you can and thank you so much for your tips. Happy to let you know that your advice is perfect ! So pleased that the crust is chewy & easy to bite into with the inside cooked with a dry texture . P.S. Forgot to mention in my previous post that I scatter sunflower seeds on the bottom of the baking pan. That way the sunflower seeds stick to the bottom of the rolls and prevent the rolls from sticking to the pan. Thank you so much for your quick reply and am looking forward to learning more bread-making tips here on this wonderful site ! Hi there, glad they worked. You could try leaving the oven at 220 and baking for 20 mins (maybe 25). Let me know! I usually bake as hot as I can! I wrote recently asking for clarification about water quantities. My query now is that having made 4 loaves each with varying degrees of success, my main concern is that the loaf is still "doughy" inside. My son called it "cakey". I read a few of the messages above and I see that you say the bread can be "sticky" and the remedy seems to be to wait 24 hours or so before eating. I'll try that approach but is there anything else I could alter e.g. the yeast. I'm using Allison's "active yeast". I note your view that "instant yeasts" just don't seem to work as well. Is "active" the same as "instant"? Despite the cakey texture everyone says the bread tastes great - especially toasted! thanks for this. in order to NOT be like cement, the dough does need to be wet which means the inside is doughy if you cut into it too early. I usually wait two full days! The other thing is to check your oven temp and maybe start the bread high (like 230 degrees) for 10 minutes and then reduce the temp to 200 and bake for a further 30 mins. You could bake it at 230 for 25-30 mins too but watch the top and cover it with foil if it is getting too brown. I am so pleased you are persevering! Alinsons's active (yellow tin) is different from Alisons "easy bake" (green tin). I prefer the yellow tin - the one you have to let sit for 15 minutes with the water before you mix all the other ingredients in! Let me know how trying a higher temp in the oven works and do get an over thermometer (or borrow one) just to check your temp! I've recently converted to 100% rye bread as the only bread in my life and it's amazing - I've been making my own using your method and consistency of bake as the template for my sourdough! 1/2 starter, 1/2 flour - It makes an amazing loaf. I use a much slower bake though - 1hr @ 170, 30min @ 150, all with a tinfoil hat. It makes a scandi-esque loaf! I'm short on time tonight and wanted fruit loaf for the morning so I've made your bread with the added extras: 1 tblsp marmalade, 2 tsp cinnamon, 1 tblsp oil and two handfuls of sultanas and a good grate of nutmeg - about to go in the oven, faithful to your 200 for 45 minutes, I'll let you know how it goes tomorrow! I've proselytised enough to get my mother to make a loaf a week using your recipe, she loves it too. Thanks for the e-help!!!!!!!!! thank you so much for your comment - I love it! You are so kind to write and I bet your mum is happy you have bullied her too! Rye is my absolute favourite and I eat it all the time. Love the slower bake too - does it result in a thicker crust, a dryer or wetting inside? Do tell and photos please! ALso, try it with ground cardomom sometime and a spoon of honey or molasses. Delish! Success at last! I tried your suggestions about using a high heat to begin with and a lower temp to finish. The result is a much drier loaf but still with a close texture and great taste. I made a 500g loaf using that amount of rye flour. I added 13g of Allison's active yeast (yellow tin) to the "well" and let it soak in 120mls of water for about 15 mins. I then added 6g of salt (I don't like to use too much salt) and approx. 300mls of water. 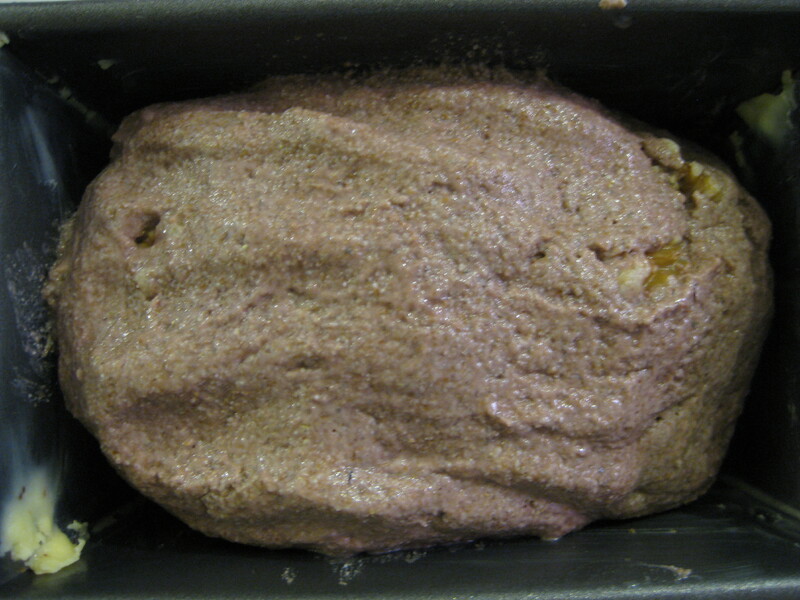 I made the dough in the way you suggest passing from wet hand to wet hand and plonked it in a silicone loaf tin. I baked at 230 for 20 minutes, covered with tin foil (the crust was very brown) and baked for another 40 minutes at 180. I left the loaf until today (2 days of torture I can tell you!) but it was all worthwhile. Everyone who has enjoyed a slice or two has said it's just about perfect. I shall cook and eat nothing else! @virtuousbread, success also with my rye rolls lately! is I put the rolls into a cold convection oven at 225C and bake them for 40 minutes. I don't turn down the heat during the whole baking process. When the rolls are done I take them out & place a clean towel over them so steam softens the crust. The end result is perfect rolls that have a thin crust and are dry and cooked inside. They freeze beautifully & taste like they were freshly baked if defrosted at room temperature, not heated in the microwave oven. that is just marvellous! I am pleased. With rye, I always think 2 days in advance so once you get into a routine, you will always have it! You may want to cut your yeast down to about 5 grams. Seriously. The dough will take longer to rise - between 3-5 hours depending on how cold the kitchen it (try it all day or over night in the fridge and then just pop it in the oven) but it will taste better and be even better for you. Great recipe. I am new to bread making, and I am wondering if it is it possible to make a larger rye loaf than the 500g one specified? If it is, can you please tell me what needs to be done differently? thank you for your message. Just scale up the recipe to whatever size you need. Double it or multiply by 1.5. I have found that, unlike wheat bread, a bigger rye loaf can take a wee bit longer to bake. And, start the oven off higher - like 230 degrees - for the first 10 minutes and then reduce it to 200. That normally does the trick. Let use know! I tried this recipe the other day using Dove's rye flour and Allinson's active dry yeast (yellow tin) - both freshly purchased last week - and the dough did not rise at all. I came to one of your bread making sessions ages ago and made a wholemeal loaf; thus I remember the whole process of making the well for the yeast and so on, but have not had any joy when trying to bake a loaf on my own! Should the yeast be activated in warm water separately? Yes - with yellow tin (dry active) yeast you must "proof" it in some of the water for 15 minutes first. When it is dissolved, add all the other ingredients and knead and follow the instructions. Yellow tin yeast needs this extra step! I have a wheat allergy and am very happy to find this recipe. I am wondering how long I can keep this on the counter after making ( you mentioned it is best eaten 1-2 days after making) and should I cover it with something? is it okay to keep this on the counter in warm weather? also the baking temperature which is 200 degrees.. is that 200F or 200C? THanks!! you also mentioned that 6 g of yeast is needed. is that 3 grams of active dry yeast or instant yeast? thanks!! can't wait to make this! Hi there - sorry for late response but I see you have had a go. You need 6 g fresh OR 3 g dry active OR 1.5 g instant. With rye, in all cases it helps to dissolve the yeast in water first (following instructions for active dry yeast) as it helps the yeast get going. Don't get too technical - just pop in a teaspoon of yeast! I wrap up my bread in a tea towel - just that! Temp is Celcius! Hello I want to cook this lovely looking recipe. I have a question? What yeast manufacturer do you use? I've looked at loads of yeasts I am confused! Its confusing when you read the descriptions of the different yeasts! Especially instant yeast and dried yeast. The yeast I was thinking of using is Allinson Dried Active Baking Yeast. I followed the recipe but my loaf was very hard, heavy and doughy, what could i have done wrong? 3. take the time to proof the yeast - whatever type it is - to maximise your "rise"
all else fails, come and take a course with us! Thank you for your advice. My second attempt was better but the dough did not rise much before, or after baking. I used 1tsp about 5 grams of the Allinsons dried active yeast. Left it for 15 minuntes. I left the dough to rise for 3 hours and although it rose a little it didnt rise very much. I baked it for 10 mins at 230 then at 200 for 30 mins. It tastes good and the texture is ok but it just didnt rise. Any tips? Hi. My rye bread comes out with the crust hard and tasty, separating from the centre, soft and sticky. Is this the oven temperature? Hi there, this crust separation is a sign that the bread has over proofed (ie too long rising before you bake it). When you say the centre is sticky - that could partly be because the bread is collapsing (over proofing) and so there are not a lot of air holes to help it bake. It could be oven temp/time in oven. Do check your oven temperature with a thermometer and also remember that rye IS sticky because the dough is so wet. It's best cut into 24-48 hours after baking. Let me know how it goes! Hello, I'm curious If you have tried making this Rye Bread recipe with sour dough/wild yeast. I noticed the Rye bread recipe recommends 1.5 g instant yeast or 3 g dry yeast or 6 g fresh yeast. How many grams(g) of sourdough starter(wild yeast} would be recommended for this Rye Bread recipe? Other than a 1 lb / 500 g bread tin , will a 5.5 lb. / 2,750 g Staub cocotte or French oven (enameled iron with lid) be suitable for this recipe? I have no idea what a Staub cocotte is! And if you would like to bake it in an "oven in an oven" i see no reason why it won't work! Hi there, Thanks for the detailed recipe! Just wondering is it possible to add molasses/malt into the mixture to make it dark. Would this 'destroy' the light and airy texture this recipe called for? cover the bread with foil. well that's odd, never heard that before. I suspect it may have been over risen before you put it in the oven? hi there, not at all. The bread is super light whether or not you use molasses or honey or malt. I use maximum 50 g and when I say "light" i mean in texture, not in colour! Love your site and all the comments, but I live in the U. S. and am unused to your types of measuring & heating. Any suggestions other than just 'doing the math'. Hi there, online you can find all sorts of cooking conversion tables - if you google "cooking conversion tables" you will find them! Hi! I'm just about to make my first attempt at making this bread however after reading all the comments above I'm a bit confused by the yeast!! I've bought the brand Allinson but it just says "easy bake yeast" is this instant or dry?? Hi there, Easy Bake and Instant are the same thing! Hi! I tried making this bread but i had a problem.the bread did rise while i was waiting for about 2 and a half hour. Then when i baked it didnt rise but fell i the middle. What could have happened? I used instant yeast. You are mislead your readers- real German Pumpernickel bread haven't contain any molasses! The sweet taste is obtained as a result of the conversion of starch into sugars (reaction Maillard ). Dear Elena, thank you for that. I think you will find - and this is the joy of bread - that there are many ways to make pumpernickel and many different shades of brown! The very very black pumpernickel really does have molasses! Malt syrup is just not dark enough to give it that. Other varieties do not have it! Thank you again! Hello, lots of things could have happened. It could have over proofed (but you would have noticed really big holes in the top of the loaf before baking it) or your oven it not up to temperature, baking at too low a heat could have caused that. Do you recognise that either of those could be the problem? Thank you! In the middle of a 3 day sourdough and needed some bread. Found your recipe and looked good so tried it adding honey and caraway seeds. Really delicious. I'll certainly be making this again. Hi there, this recipe looked great because I recently found out I am allergic to wheat and I so miss eating bread! The bread rose beautifully.However, when I uncovered it, it shrank a bit. I put it in the oven for 400 degrees F and took it out 45 minutes later and it shrank quite a bit, cooked on the outside, but was still very wet on the inside. I lowered the temperature and am cooking it 15-30 more minutes hoping the inside will cook because I want bread . What do you think I did wrong? Maybe I should not have uncovered the rising bread until I put it in the oven? I have seen a question about this recipe in a bread maker but could not find a reply? I tried it yesterday on the Gluten Free setting but it collapsed in the middle I know you don't use a bread machine but would the quantities be any different do you think? I tired to use a program with little kneading as I know Rye Flour doesn't need kneading! Hi there, not sure why it shrank. Perhaps it was in fact OVER prooved? Check your oven temperature with a good thermometer and if it's not up to temp, get it calibrated. If you are desperate, put it up as high as it can go, put the bread in and then reduce it to 200 (400) or even 220 (425). Rye takes some getting used to and fiddling sometimes. Remember don't cut into it until it is at least 24 if not 48 hours old. It has to dry out. It will always have a sticky texture and some people don't like that. It's never dry like wheat bread it. Let me know how it turns out next! Hi, thanks for this recipe. I've made this tonight for the first time, it's very easy to make. It didn't rise very much, I put it in the airing cupboard to rise for just over 2 hours (our kitchen is very cold, I was worried it wouldn't rise). Having read the comments above I wonder if the dough wasn't wet enough. Also I think the crust is very hard (I haven't cut it yet, trying to wait 48 hours! ), I baked it at 200 deg C for 45 mins, so will try with a hotter oven next time. and how was it? If it did not rise very much, just leave it longer. Remember it's when there are little holes all over the top of the loaf that it is ready for the oven! THe first time I made this bread, it did not rise at all. more than the first, but not rising to the top of the bread pan. I doubled the yeast. The flavor of the first loaf was good, but I would like it to rise. Hi there, I would not double the yeast - I would just be patient! Rye is slow and on a cooler day or in a cooler kitchen it can take a long time. Make sure your yeast is alive, proof it in warm water first if you want to (although you don't have to) and just be patient. it will rise. trust me! Just come back from spending New Year In Iceland. Sampled the most fabulous warm rye bread with winter herring. The bread had been baked in cardboard ex- milk/fruit juice containers and in the hot volcanic earth near the active geysirs for 24 hours. They use the natural geothermal heat to bake the bread. A long time to wait for a delicious loaf ,however ! wowo! how amazing! thank you for letting us know, I wish I could try to make it - alas - I have no source of geo thremal heat near me! You can also try my recipe for real dark Danish rye bread at my website http://www.ryebreadrecipe.org. It also contains video with instructions. Try it out. A make that bread every week for my family. Ooo how lovely! Thank you so much. I will visit the site today. I love rye! I made rye bread for the first time using this recipe using Doves Farm Organic Wholemeal Rye Flour. I Was quite pleased with the results, Certainly nice and edible but not quite as light as I would of hoped for. I know a loaf like this is never going to be super light. Tonight I made another loaf but this time I added more water, probably about 310 -320grams and put it into my silicone bread tin with a mug of hot water to rise for two hours in the microwave (I did this with the first loaf). When I opened the the microwave door to my great surprise the loaf had risen to double the size. I have, I think created the perfect wholemeal rye loaf except next time I'll put some seeds in to make it a little more healthy and tasty. Thank you very much for the recipe but I'm curious as to what rye flour you used, seeing you are in UK. Perhaps My rye flour is very dry and super absorbent, or maybe it's because I used whole rye. Just to let you know that after three attempts I have got this bread to rise as it should! At first I thought it was not enough yeast or too much salt, but as you keep saying the key really is to use loads of water, much more than I'm used to with wheat bread. I needed 320ml of water to 300g of Doves Wholemeal Rye to get a really soft jelly-like dough. In fact the rise overflowed my 1lb tin so I will have to put it in a larger one next time. Thanks for the recipe, first time I've ever tasted a light rye bread and its lovely. well that's marvellous where do you live? Thank you for the converter information, now I have to try rye bread again. My first attempt was heavy as a mill stone. Hi there, I'm on to my second loaf of bread and felt adventurous so I tried your wine idea.. Your instruction said to wait til the yeast fully dissolved before adding more wine/water. I'm using dry yeast and after 15 mins I could still see the yeast so I left it, got distracted and came back an hour later to find the yeast still not dissolved but mould growing. Is this normal? Will it cook out? I kept going with the instructions regardless and am now over to the next day of rising. The last bread didn't rise much at all but I've read your comments saying to be patient so I'm waiting longer with this one. Thanks for all your help! I hope I can get it to work! Oh actually, I also added bi-carb to the second loaf to see when it would rise (in with the second lot of water) and that's when I saw the mould! Hi there, I am certain it is not mould but a kind of a beige sludge that will eventually form on the surface of water (wine) when you leave it long enough. An hour is not enough to grow mould so don't worry! How did it go? Bicarb is certainly not necessary and it would certainly cause foaming but once again worry not, it's not going to be mould! The bread turned out really nice thanks, my husband loves it. I have just adjusted it a bit to how we like it. I'm now on to my third bread and starting to feel like a professional haha.. Back to water again but the wine was a very welcome and interesting change.. You're right by the way.. The bread does taste better a couple of days later! I am going to try this recipe, my previous attemps failed totally. What about adding chillies and some garlic(just a tiny bit) for taste? Hi, I have been scouring round the Internet for the best rye sourdough bread recipe and this is the best I've found that is simple, but its not a sourdough recipe. I'm trying to learn the bakers percentages as I am going into baking bread professionally, and im dyslexic. And I'm trying to get my head around the Detmolder 3 stage process. I know what I will be asking is different than your recipe because I am trying to make a sourdough using rye flour at the moment. So, my question is, can and how can I convert your recipe to use with my rye sourdough starter? I hope all of this makes sense. there is a really easy rye sourdough recipe. Remember, there are a million ways to do anything and what I have led you to is only one way! type "sourdough" into the search bar and they will pop up. absolutely! You should add in whatever you like! I like it with raisins and cinnamon too! Thank you for that advice. I live in Staffordshire in the UK. I will have a look at those websites you have shown me. I already have a Rye Sourdough Starter, I'm was just stuck on my Sourdough, but now that you've given me some links, I have a direction to go in. This was really easy. I've made it twice and I've had two pretty good results. Good in that the sense that they were tasty and had risen okay. However the better one was definitely the first one in which I accidentally put nearly twice as much water as recommended. I'm trying it again now with extra water. I'll see how it goes! So at loaf no. 3 I can say that I seem to need twice or nearly three times as much water as suggested in the recipe. This might be because I'm using a wholemeal rye? (I'm also using the yellow tin of Allison's dried yeast). My loaves also take quite a long time to rise (three hours minimum even in midsummer). But the result is a really great texture and a delicious loaf! THanks so much for the comment...all flour is different which is why water is only ever a guide and especially with rye you need to get comfy with a sopping wet dough! I am so pleased you persevered. The enzyme level that naturally occurs in the flour also impacts the speed of the rise. In the UK where I sometimes live my rye moves much more quickly than in Mexico even though here it is usually much hotter. Different flour! On my way to the store now. Will let you know how this one turns out. Beautiful day in South Africa Lowveld near Kruger Park and I am going to bake my first rye. I am off any wheat or white flours for 10 days now. Here we go. Love and light Namaste to all. I agree with Liz that the dough needs a lot of water. For my rye breads (that is the Danish dark style) I make the dough so the texture is like a bit thin oatmeal. Btw it is funny to hear that rye some places has a bad reputation. As being dense and heavy. I guess it is places where it is only known in products like pumpernickel. The dark rye bread we eat here in Denmark is not comparable to pumpernickel. Ours are much more light and with air. We always add other flours too, to make it get those qualities too. Dear Christian, thanks for this - you would be amazed at how most people think they do not like rye because they really only have tasted that rather dreadful pumpernickel from Aldi! My family is German so I grew up on all sorts of rye and "mixed bread". I find properly made rye light and moist and delicious. I will check out your rye recipes right now! Thank you for writing. Gonna try your bread recipe. So afraid of making yeast end breads, do not like the taste of yeast. I live in a rural area of a small Caribbean island and I only see instant yeast...I think. Please tell me again the best yeasts to use. Not brand, as there are very few brands, the type please. Hi, I have tried this recipe twice and both times have failed. The first time I used instant yeast, after 30 minutes of baking it, the middle fell in. The second time I tried I used dry yeast, I left it over night in the fridge and it did not budge so I left it out for the day to rise (so I'll see when I get home if it did anything). The second batch I ended up adding 300g of water to my flour and still seemed a bit stiff. Do I keep adding water until it's not stiff? FYI - your recipe gives '250 grams of water'. Hate to tell you but water is measured as a VOLUME not a MASS. There is a difference! I suspect you mean MILLILITRES, not grams. Will try your recipe. Hope it works out. thanks for your comment you are clearly a really experienced chef however, in the UK we often measure liquids in grams and, as bakers in the UK the vast majority of us do. SO, you will see that all of my measurements are in grams as it is much more accurate to weigh everything on a digital scale. Try it! They are not expensive to buy and the results are exact. I am sorry for that. There are many reasons your bread may have collapsed while baking. It may have been over proofed going into the oven and/or it may have proofed in an overly warm climate. I find if it is much over 25 degrees C the rye can get a bit collapsey! As re water - yes - just keep throwing it in until you have a nice soft dough. Some rye absorbs more than others (as with all grains) so the water content for any bread recipe is only ever a guideline! How did the second one do? Did you proof the dry yeast before adding it? 1ml of water weighs 1g, so the two units are interchangeable. 250g is the same as 250ml. The second loaf didn't turn out very nice. It was very dry and took almost 24hrs to rise. I will add more water next time. I did not proof my yeast before I added it, I will proof it before hand. you always have to proof dry yeast - no matter what the recipe is. And, with rye, it often is better if you proof the instant kind. 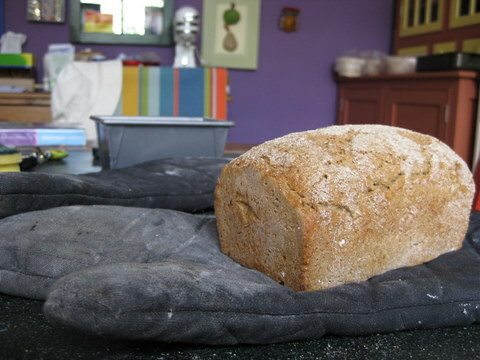 Have a read of this (and the article written before it to which there is a link in the recipe) http://www.virtuousbread.com/bread-and-conversation/easy-recipe-for-rye-bread-part-2/ Please try again. It is worth it when you get it right. Just had my first attempt. The dough rose up quite well put sagged in the baking phase. Also very hard and crusty round the edges and quite brown, like a tan colour. I think I made a mistake by not proofing the fresh yeast ( how do you do that). Also the fresh yeast was doughy, should I have dried it out allowing me to sprinkle it into the mix. the dropping whilst baking may be a sign that it was over risen before you baked it. Try putting it in a little earlier next time. You don't have to proof fresh yeast - just crumble it up and mix it right in. You don't have to dry it - it will disappear into the dough - just mix with a will! You are on the cape coast! Lucky you - I love it there and am lucky enough to visit every two years in December! The flour you have is wonderful and when I am there I enjoy travelling around, visiting bakeries and basically just eating a lot. I don't know about the vinegar except that rye bread tends to be a bit gummy (you may have noticed that) unless it is made with pure sourdough rather than added yeast because the acidity of the sourdough does something chemical which reduces the gumminess. That could be the function of the vinegar and it's actually a very interesting idea and one I will try. 60 g of vinegar for how much flour? Let's both try! I have to get my oven mended first.....yikes. Just completed my second attempt. Slightly better but still dropped. Decreased the yeast to 5g, salt a little less, rising time 2hr but this may be still too long. Eureka Mills in Heidelberg recommend +- 1hr which I will use on the third attempt. I am inclined to think that the quality of the flour makes a big difference to the rising time,baking time and temp. of bake. Their recipe is much the same as yours except for the vinegar which they recommend in the proportion +- 60g per 2000g of flour. The use of vinegar in rye bread is because of the amylases#$? in rye bread which, as you correctly point out, causes gumminess. The acid in vinegar overcomes this problem. Be in touch. it's summer right now, right? how hot is it? if it is much over 26 degrees, rye simply will not cooperate. I recommend mixing the dough, tinning it and putting it in the fridge to rise. 8 hours should do it and bung it in a pre heated oven straight from the fridge. Put temp to 230 and then drop it to 200 after 10 minutes and continue to bake for 30 minutes. 40 minutes is total baking time. OK will do that for my third attempt. Although it has been stinking hot recently, by chance it rained all day on Wednesday which was my first attempt day and the temp. dropped to 21. It was back to hot again today. Anyway i'll try it your way. If you scroll through the many notes on this post you will find one from somebody who did it successfully in a bread maker. I have never tried (and don't own one) so alas I cannot help you. My recipe, as you see, is only flour, water, salt and yeast. Dear Anne, how kind you are to leave this wonderful comment. I am so pleased! I love rye and all the things that contain rye. I am so pleased you do too! I am afraid I do not know. Try google in Croatia, I am sure someone has figured it out! Being a Nordic rye baking hobbyist/enthusiast from Finland, just wanted to point out that molasses or treacle are not the only way to make traditional Scandinavian or Nordic rye dark in color, but one may use about 5-10% of brown or black malted rye flour instead, or for added darkness when preferred. Added sweetness is not necessary for dark rye at all. In general it's advisable to make rye sourdough as it's known to enhance digestibility of rye's nutrients, while using malted rye adds to the improved digestion, also it's quite customary to use cumin seeds with rye for that same reason.